Tottenham manager Andre Villas-Boas has confirmed that striker Jermain Defoe will be ruled out for up to three weeks because of ankle ligament damage. 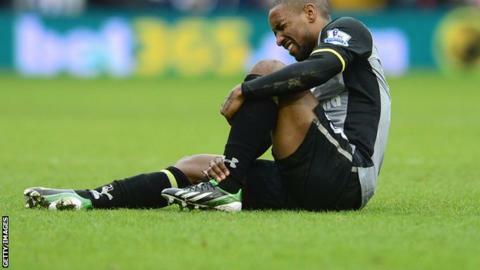 Defoe, 30, suffered the injury during Sunday's win at West Brom, leaving Spurs without a recognised striker. "It will be two to three weeks," the Spurs boss revealed of Defoe's absence. Villas-Boas said Emmanuel Adebayor, who has missed the last four games because of African Cup of Nations duty, would return against Newcastle on Saturday. Adebayor's Togo team were eliminated by finalists Burkina Faso in the quarter-finals of the African tournament but the 28-year-old, who joined Spurs permanently in August after a season on loan, was given additional time off after saying he was "exhausted". "He had issues to take care of as the tournament finished for Togo, so at the moment we're trying to see if we can have him back either for today [Thursday] or Friday's training session," Villas-Boas explained. "I spoke to him Monday morning. I know where he is, I'm not sure if I want to make it public." Having closed the gap on third-placed Chelsea to just a point with victory at the Hawthorns, which extended their unbeaten league run to 10 matches, Spurs face Newcastle in the lunchtime kick-off this weekend. "Obviously we have to take a look at him first," Villas-Boas said of Adebayor, who has made 14 league appearances this term, five of which have been as substitute, and has scored twice. "We don't have any news regarding injuries from him, so he's going to be selected for sure. "I have to make a decision whether he will be in the starting XI or not." Defoe began the season in great form with 14 goals for Tottenham in his first 26 games, but his truncated appearance at West Brom was his sixth match in succession without finding the net. Spurs were expected to sign a striker during the January transfer window but a move for Brazilian Leandro Damiao was unsuccessful and 19-year-old forward Harry Kane was recalled from a loan spell at Norwich as cover.